Reboots of beloved films have been pretty hit and miss down the years, sometimes it can work and other times they can miss the mark completely. The Planet of the Apes prequels however, have been consistently strong throughout, with its interesting story and characters and its third installment is no exception! It provides us with an intense yet satisfying conclusion and showcases incredible performances and action sequences, that has enough to keep you interested throughout the film. The leader of the apes, Ceasar (Andy Serkis, Star Wars VII: The Force Awakens) has grown more conflicted and tormented within his instincts, since the last film he has retreated to living in the woods away from the humans for the safety of himself and his clan of apes. When many of the apes are attacked and kidnapped by an army of humans led by The Colonel (Woody Harrelson, The Edge of Seventeen), Ceasar must face against him in a battle to avenge his own kind as they battle to determine the fate of their own species. This film seems to show more focus on the apes and their battle for their own species, and less on the interactions between them and the humans as the previous two films did. 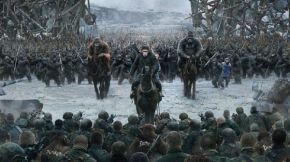 It created a more intense atmosphere than the previous films did, as both the human and ape species are at risk and makes you wonder who will conquer and who will fall down along the way. They provide us with the best action scenes from the entire trilogy which will have you on the edge of your seat. Director Matt Reeves, did a superb job at showing a more darker and complex story and displaying how Ceasar has progressed from the previous films. Whilst he had shown a soft spot towards the humans despite the treatment he received from most of them, here he has shown to cut off any affection towards them and is more focused on trying to protect himself and the rest of the apes. The motion capture performances are outstanding, considering that most of the acting is shown through their expression and movements, they still manage to have you invested in their performances, even in scenes where there’s no dialogue they make you empathize with what they have been through. Whilst Andy Serkis has given many brilliant performances through motion capture down the years, his performance as Ceasar is one of his finest yet! He brilliantly portrays Ceasar’s own instincts becoming darker and how he’s fighting to survive and protect those that he cares about. Woody Harrelson is by far the best villain in the franchise. He is completely sadistic towards the apes and shows no mercy towards anyone who tries to get in his way with both the apes and his army. You fear him because of his actions and ruthlessness to get his own way, but at the same time you become drawn to how dark he is and wonder what he has in store to destroy the rest of the apes. Amiah Miller, who played the mute orphan Nova bought the innocence and kindness to her role, in a film with mostly intense characters she provided the light for the audiences as well as the apes as they prepare for battle. She didn’t even have any dialogue, yet she still managed to give a fantastic performance. With brilliant battle sequences, invested performances and a strong story to follow. War for the Planet of the Apes is another solid effort from the franchise and definitely worth seeing this summer.